Residents near a fire at a disused building in Peterborough have been advised to keep their doors and windows shut as smoke billows from the site. More than 50 firefighters have been called to the former depot of toiletries company Potter & Moore in Mancetter Square, Werrington. 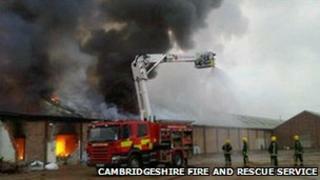 The fire service said smoke was seen billowing from the building shortly after 1400 GMT. The incident is on-going with one appliance remaining at the scene. At the height of the fire there were 11 fire engines.